A big chunk of our hard-earned money ends up in the greasy, grimy hands of plumbers, electricians, heating and air conditioning technicians, etc. Owning a house comes with maintenance costs that can amount to $4,000 or more per year. It’s about time we focused on how to save money with some basic DIY plumbing skills! Here’s a list of the things you (yes, YOU) can do around the house yourself. No technical skills required. Beyond basic DIY plumbing, just about any aspect of your home is within the do-it-yourself realm. For any issues with the tank, you don’t need to worry about dirty water. The inside of the tank is probably one of the least contaminated spots in your home. Only clean water goes in there, trust me. But don’t go drinking a glass of toilet tank water or anything silly like that. 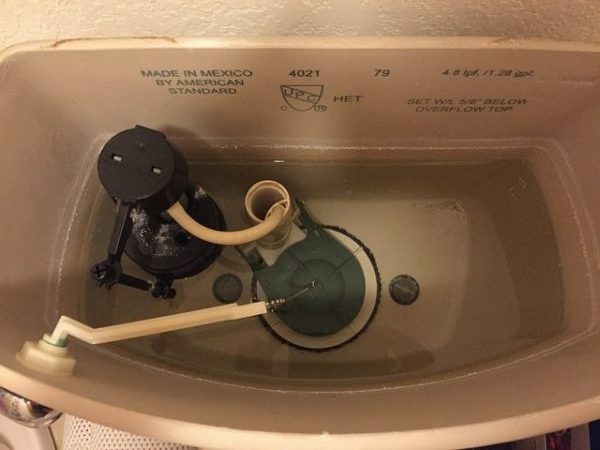 Your first step in making any repairs within the tank is to turn off the water to the toilet. The shut-off valve is located near the bowl. This will allow you to flush whatever water is in the tank so you can easily replace worn or broken parts without cold water in your way. Your local hardware shop can help you find the right flapper, flush lever, or fill valve for your particular toilet model. There are tablets you can buy at the hardware store that’ll dissolve in the tank. Do not flush – if your toilet is leaking water, you’ll have colorful blue water in the bowl within minutes. Flappers wear out over time, making for noisy, leaky tanks. They’re very cheap ($3-$6) and EASY to replace! Replacement of other parts, like the fill valve, are pretty straightforward. Again, just take a picture of the tank’s inside with your phone, and bring the old fill valve to your local hardware store. Side Note: Try to walk or RIDE YOUR BIKE to the local hardware store if you’re within a couple miles or less. It’s much less frustrating to roll back there on two wheels to get the RIGHT part the third time, than it is to drive back twice. At least you gain some exercise from the process! To replace the entire toilet, turn off the water supply first. It’s the little valve behind the toilet covered in pee and dust. Once off, flush the toilet a time or two, then sponge out the rest of the water (don’t worry, it’s clean!) from the tank. Next, unscrew the supply line from the tank (underside of the tank). You should be able to loosen and tighten with your hand. Never over-tighten the supply, but do make sure it’s a tight fit. You might need to hack off the bolts holding down the bowl to the floor, if the bolts are too rusted. Just make sure the new toilet has enough fit and clearance with the wall behind the tank. Removing the toilet isn’t too terrible. After the nuts are unthreaded from the floor mount bolts, simply pull the toilet up and away. Set the old toilet out in the backyard for now. Maybe a passing neighbor will have an interest? I always take an old rag to pop into the drain in case any gases come up strong. You’ll next want to pop in a new wax ring over the drain. Even though the old one looks gross, remember it’s just wax. Scrape it off with a putty knife and pop in a new wax ring, centered. Attach the water supply to the tank and use a little teflon tape to ensure no leaks. Seal around the base with a bead of caulk to stabilize the tank on the floor. Voila! Who needs a plumber? Here’s a very good video from This Old House that’ll walk you through the entire process. For this kind of work, you might want to stretch out the back muscles a bit, because you’ll probably be doing a good amount of the work lying on your back under the sink. Just like with toilet repair, there’s no big secrets or mysteries to fixing or replacing a kitchen or bathroom faucet. If you know you have to replace your faucet, or are simply upgrading, make sure you turn off the supply valves first, which should be right under the sink (hot and cold). Oftentimes, a newer faucet from a reputable company (e.g., Kohler) comes with a lifetime warranty. We’ve had Kohler send us a brand new faucet head for our kitchen faucet TWICE in the past year due a clogging issue. Free. No questions asked. A reduced flow of water from the hot or cold supply could be due to a few factors: the supply pipes may be rusting out from the inside if they’re old galvanized steel, or, the supply on/off valves are defective. Galvanized steel is rotten stuff. It’ll last several decades, then drip, drip, drip, clogged. Go with copper, or even better, PEX. If you’ve isolated the problem to the valve (you can check this by comparing hot vs. cold valves – both rarely fail at the same time), be sure to replace with a quarter turn valve. They are more reliable and durable. Compression fittings are easy to install – no soldering required. Just remember to apply a little strip of teflon tape – enough to go around the threads for to six times. Be sure to apply the tape in the direction of the threading for best results. For your viewing pleasure, our friends at This Old House have a great video on leaky faucet repair. Many of the same concepts apply for fixing leaking drain pipes underneath the sink. The great thing about drain pipes is you don’t have to worry about turning off supply valves before you work on them. But you should have a bucket and rag ready to catch any water resting in traps. PVC tubing is simple in its design, and easy to work with. Simply unscrew joints with your hands to disassemble the length of drain where the problem (clog or leak) is isolated. One of the things I’ve learned from our rentals is it’s super important to a.) limit run length as much as possible (shorter the distance, the fewer the joins and failure points) and b.) make sure the fit is as square as possible. Crazy how some people don’t bother to get a proper fit and wind up with leaks and failures over time. All it takes is a tape measure and a few seconds with a hacksaw to get it right! How much can you save with DIY plumbing skills? Sometimes you just need to trust in your ability to learn and turn (wrench or screwdriver, whatever the tool for the job happens to be.) 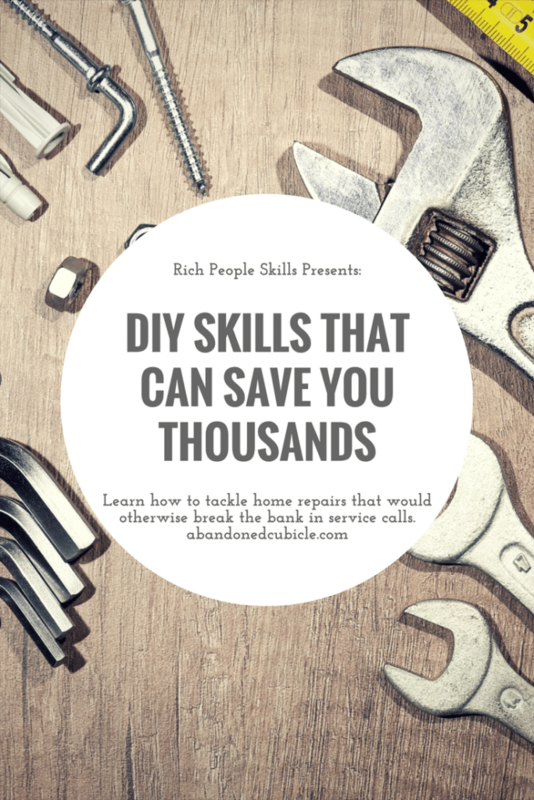 With an average of three service calls avoided per year, at a cost of $150 per hour, you can figure to save close to $500 per year with some basic DIY plumbing skills. Let’s look at the 40 year opportunity cost of these skills. If you start using your toolbox in your 20s, you could save $127,000 by the time you start collecting Social Security. It’s perfectly understandable that you’d prefer to relax and unwind after a hard day in cubicle land. Heck, I’d rather read a novel or play golf instead of replacing a dirty old toilet too! That said, it’s pretty dang rewarding to fix problems yourself, and work with your hands. The money you save is icing. Give yourself a sense of accomplishment and show a friend how it’s done. You might get a beer or two out of the deal! Next: Is Stress a Good Reason to Retire Early? This is a great, very useful post! I grew up blue collar, working for my dad’s construction company. The skills I learned have saved me a small fortune. Just this morning I fixed a stripped hot water handle in my bathroom sink. Nice work, Ty! It doesn’t take much to get started on this path. And once you make that first repair or upgrade, the confidence to take on bigger jobs grows. These days, I’m putting more into learning detailed bike repair. Great post! I’ve tried my hand at DIY a few times and now that I’ve had a bit of success I feel more comfortable trying first rather than paying someone. Coincidentally, just yesterday I noticed one of my toilets running. I took a look and after a brief minute playing around with things I determined it was the flapper meeting water leak out. A quick trip to Lowe’s, a five dollar part and less than five minutes installation and it was fixed! My dad is an awesome DIY. I unfortunately do not have his same level of confidence but still attempt to do it. Usually if I get stuck I can call him to help me. With Youtube and other videos available it’s really made life easier for DIYers. You know, that’s where (my dad and step-dad) I got the confidence to attempt a lot of these things. I hope to pass along some of the lessons to my little ones. Worse case, they’ll be darn good with YouTube. ???? A person can indeed save a lot of money by fixing these things on their own. Not my specialty but am working to get better at it. I have a buddy who can fix about anything and would help me out a lot but alas we moved to a new city now. Google and Youtube time baby! You can do it, Amber! Persistence pays off. One tactic you can try is shadowing a friend who has these skills. Apprenticeships are key in the trades, so why not do that with DIY? Best! I remember my first place the toilet didn’t work properly, I resolved to fix it myself rather than pay a plumber a couple hundred to do it. Took a few hours, about 3-4 back-and-forths with the hardware store (multiple things wrong, learning as I went). It’s surprisingly easy to fix most things around the home, just need to have the confidence to try. That sounds familiar, MrSLM. Thanks for sharing your example! That’s really the gist of scrutinizing everything we traditionally outsource: just need the confidence to go in and try – but keep YouTube on stand by. LOVE this! We are all about DIY at our house – it’s saved us a ton of money over the years. We gutted and remodeled both bathrooms (and much more) in our last home. 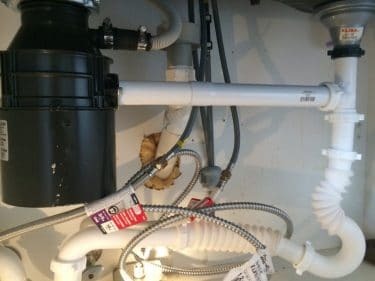 On the first bathroom, it took hubby a little while to get all the plumbing down, but he did the second one in no time after learning those skills with the first. I even wired the outlets in our basement a couple of years ago – lo and behold, they are still in good working order! Sometimes it takes a little upfront investment of time, but those skills will stick and come in so useful for future projects – plus doing them yourself saves sooo much money! Nice work, Amanda! Gutting rooms and starting from scratch takes a lot of hard work and knowledge. I have yet to do that myself. The main point you make is that it’s like learning to riding a bike. So true. Clogged drains. 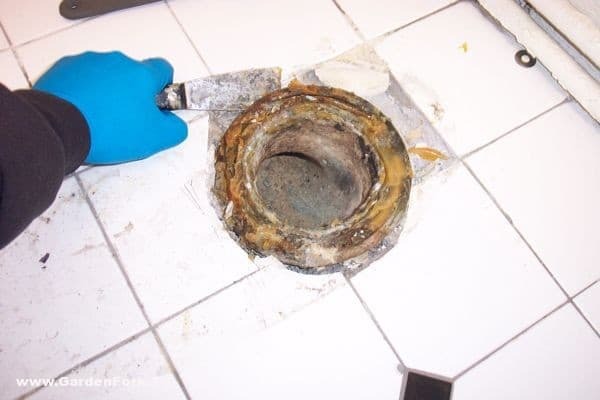 Many of these calls could be avoided by taking greater care in what you put down drains- especially the kitchen sink drain, the most used and most clogged drain in the house. Indeed. Never ever ever throw potato peels down that thing!! I have to 2nd that YouTube is the place to go to learn all kinds of DIY skills. Most the time you can find a video and just follow along. I’ve done a lot of DIY repairs using YouTube as my guide. It allowed me to repair things around my house and car that were way beyond what I thought my DIY skill level was. YouTube rocks! I’ve fixed two dryers, a couple washing machines, and a hot water heater thanks to Tuber. Sometimes the Internet does good things, right? ?